Park and Ryu ended up as co-winners of the Player of the Year points race, tied atop at 162 points. 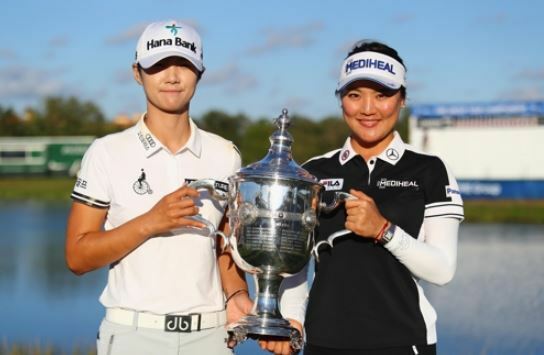 They're the first pair to share the top player award since its introduction in 1966, and Park is the first rookie since Nancy Lopez in 1978 to sweep up the Rookie of the Year, the Player of the Year and money title. Prior to this tournament, Ryu held the lead at 162 points, three better than Feng Shanshan of China and five ahead of Park. Lexi Thompson was in fourth at 147, and those three were the only ones with a chance to catch Ryu at the Tour Championship. Players are awarded points for top-10 finishes: 30 for first, 12 for second, nine for third and seven for fourth, six for fifth and five for sixth, and so forth. And by tying for sixth place, Park earned five points to pull into a tie with Ryu, who failed to add to her total by placing in 30th place. Feng tied for 21st. Thompson had a chance to win the tournament and the Player of the Year honors at the same time, but missed a par putt from tap-in range at the 72nd hole to finish one shot behind Jutanugarn. Park also had a chance at winning the Vare Trophy as the scoring champion but ended up in a close second behind Thompson. The American had the lowest scoring average at 69.114, with Park finishing at 69.247. Park needed to be nine to 10 strokes better than Thompson -- 10 strokes if Thompson reached 10-under par or more. Park began the final round at the Tour Championship tied for second with six others at nine-under, one stroke behind four co-leaders on the jam-packed leaderboard. Seven other players were sitting at eight-under through 54 holes. Park had three birdies over her first six holes to briefly move to the top, but she parred her final 12 holes to close out at 12-under 276. Park was actually six shots better than Thompson through 36 holes, but that advantage evaporated in the third round, when Park shot a 75 and Thompson carded a 69. Thompson finished at 14-under 274. Lopez from the historic 1978 season remains the only player to win the money title, scoring title, Player of the Year and Rookie of the Year in the same season. Even without the awards sweep, Park still enjoyed an outstanding rookie season. Thanks to victories at the US Women's Open and the Canadian Pacific Women's Open, Park was the runaway winner of the top rookie prize. And prior to the Tour Championship, Park was the only player to have earned more than $2 million this season. Park even climbed to No. 1 in the world rankings briefly earlier this month, becoming the first rookie to reach that plateau. Her reign lasted only one week as Feng Shanshan of China overtook her on the strength of two consecutive wins. Park was a Korea LPGA (KLPGA) Tour star before taking her talent to the United States. In 2016, Park won a tour-best seven times and set a single-season record with more than 1.3 billion won ($1.2 million) in earnings. Park also made seven LPGA starts as a non-member, and posted four top-10 finishes, three of them at major championships. Park earned about $682,000, which would have been good enough to place her 22nd on the 2016 money list.